One nice thing about heats being released every 20 minutes was that it gave you a sense of how long you were out on the course. We could hear the cheering and fanfare as the 1:00 and 1:20 heats left the starting line. So we knew that we were at about the 40 minute mark when we found ourselves working through obstacles 6-10. We had only run 3 miles! The first obstacle that had a significant traffic jam was the Berlin Walls (#6). These were a series of 2 12-foot walls, where probably 100 people were waiting in line and helping each other over. Fortunately, it was a nice rest from the hills and didn’t take as long as you might imagine. It was during this obstacle that my CrossFit training was most valuable. All of the box jumps, pull-ups and muscle-ups delivered a great sense of confidence as I approached the wall. 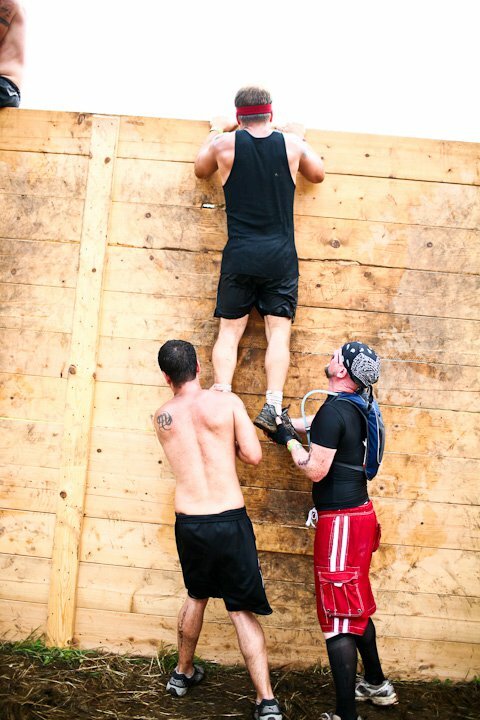 I jumped, grabbed the top and muscle-upped my way up and over the wall. It felt amazing. (Although, I’m pretty sure that means that the wall wasn’t 12 feet. It was maybe 11 feet, but I shouldn’t have been able to grab the top if it was 12. If I could grab the top of a 12-foot wall, I would be able to dunk Vince Carter style instead of Candace Parker style) Still, I felt like a total beast when I vaulted over both walls unassisted. After the walls we started to stand in line at a water station, but decided that it was taking too long and ran on ahead to the next obstacle: Devil’s Beard (#7). This was basically a large cargo net that you had to go under by passing the rungs of the net over your head. It was annoying, but not super challenging. My advice would be to treat it like monkey bars. Again, double the length and it would have been a lot harder. 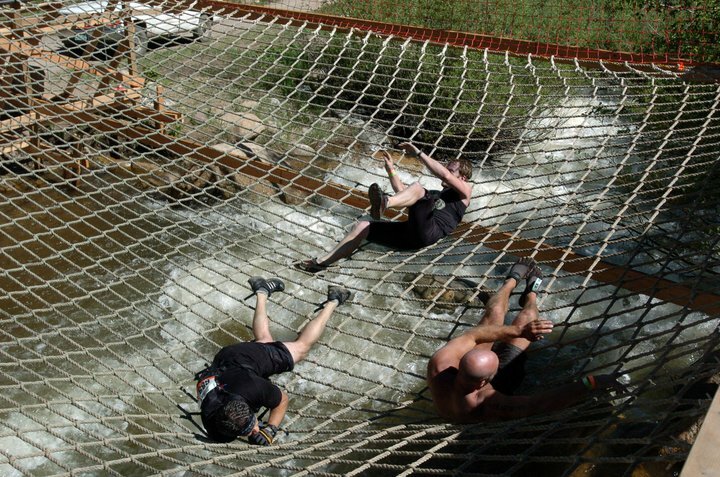 The next obstacle was a very steep (albeit short) ascent called The Cliffhanger (#8). This looked much steeper and more difficult that it actually was. I think that this was because earlier groups had made the mud more compact, making it easier to get a foothold. Up until this point, Dave and I had been able to stay on our feet. We were pretty clean, although I was sweating more than ever before. 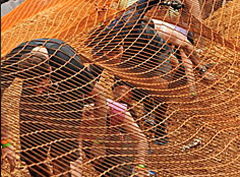 But the next obstacle gave us no option other than to get dirty: The Kiss of Mud (#9). Advertised as a mud crawl under barbed wire that was 8′ off the ground, I was a little disappointed to see that the barbed wire was more like 16′ off the ground. But they surprised me by putting jagged rocks under the mud! This made the crawl pretty painful, and it gave me some good scrapes on my knees. It also added about 5 pounds in mud that clung to my shorts after the crawl. 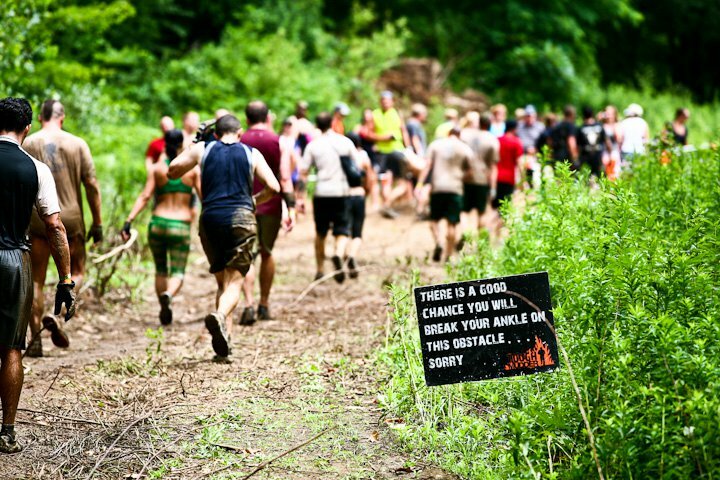 Fortunately, the crawl was followed by a downhill section of the course that ended at the tenth obstacle: Turd’s Nest (#10). This involved climbing out on a cargo net suspended between two platforms. It was pretty fun, but would have been impossible to get out of the net without a helping hand from Mudders who had themselves been pulled to safety. GREAT stuff! Thanks for taking the time to go over the course blow by blow. As you know I have a few months to go before my event in Tampa, and Funky Monkey is one of my goals to dominate, so this post was very helpful. I look forward to reading the next installment. PS – Do you mind if I use that sign picute on my blog site, http://www.toughmuddergeeks.com ? Thanks. Bob, the pictures are actually from Tough Mudder’s public Facebook album from the event. I am still waiting to get my race pics from Brightroom (they take pictures of you while you race). I think it should be o.k.